CR123A batteries, originally used in cameras then in high output tactical torches or flashlights (many of users of which have now converted to rechargeable tactical torches to much lower running costs) are still used in a number of devices such as rangefinders, remote controls, pistol lights, communications equipment, helmet lights, IR illuminators and of course cameras. Many of these devices have not been developed to use rechargeable batteries. This could be because the expected use of the product is of short duration or because of limited demand. Either way it leaves the user obligated to buy single use disposable CR123A batteries as rechargeable CR123A batteries have a higher voltage (3.7V compared to a standard CR123A batteries 3V) which could damage the device. So what CR123 battery should a user choose, especially in somewhere like Australia where the CR123 battery is expensive? The very basic battery test we did (and repeated twice) was to put two CR123A batteries into a high drain, high output incandescent (globe not LED) torch. 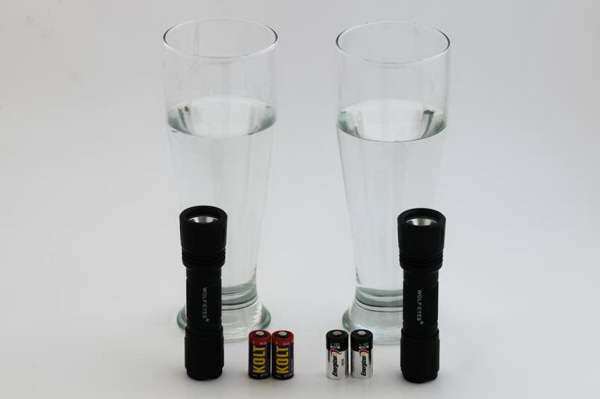 The expected runtime with these high output globes is 60 minutes for each pair of batteries till flat, so it can be seen they are high drain, high output (and expensive to run! 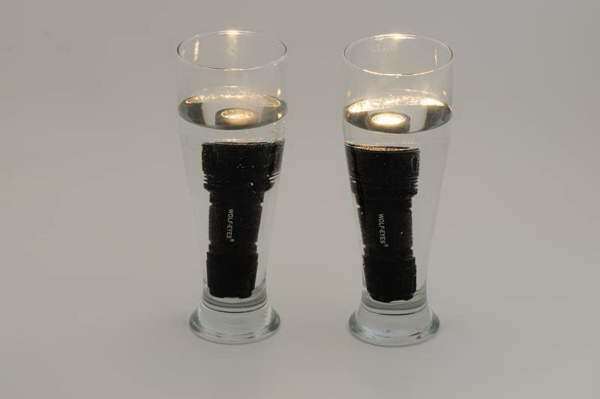 no wonder most have moved to the LED version of the same torches) devices. We placed each torch into a glass of water to keep both batteries and globe cool to eliminate variables (battery performance changes with temperature). We then measured the runtime, one till the useful light was gone, then till dead flat. The result of this test would be very different if a lower load device(such as an LED torch, remote control, etc) was used, but then the test would take days, not an hour! The big name CR123A batteries cost $12.00 each (or $24 running cost for the little over an hour this test took!) while the Kolt CR123A batteries cost between $3.50 to $2.49 depending on quantity purchased. For ease of numbers lets say $2.50 or 25% of the big name brand (still $5 to run the high drain, high output torch for an hour!). So which performed better? The Kolt batteries provided useful light till 62 minutes and was completely dead at 66.75 minutes. The big name batteries provided useful light for 68 minutes and were completely dead at 74 minutes. So from the result of our rudimentary test in a very high drain device there is no question the big name brand CR123 battery will last longer, conversely the Kolt CR123A battery provided 90.21% of the performance for 25% of the cost. In a lower load device with lower electrical threshold we would expect slightly higher performance by the Kolt CR123A battery. If you have a high drain device and can't afford the weight of carrying spares (and don't mind the cost) get the big name CR123A batteries. If cost is an issue or you can carry spares, then the Kolt CR123A battery will provide substantial cost savings. Of course if you are using a low drain device such as a range finder, helmet light, IR illuminator or similar the results may be different.The good news is now we have more options for CR123 batteries in Australia. CR123A batteries are also known as CR123, CR17345, K123A, VL123A, DL123A,5018LC, EL123AP, SF123, SF123A, CR-123A, CR17345 and 5018LC batteries. They all refer to a battery which is nominally 16 to 17mm in diameter and 34 to 34.5mm in height.